The handicraft sea salt of the Consorzio Sale Natura is the Sicilian salt made following the traditional methods used since the Phoenician age. Rich in iodium and other healty trace elements, it is dried in a natural way and packeged without additional treatments. 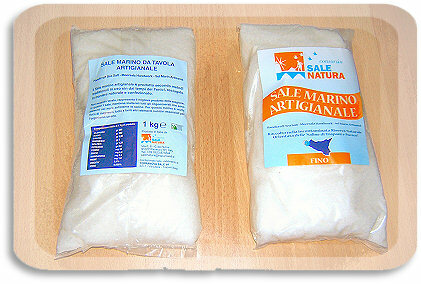 It is very important to notice that the handicraft sea salt of the Consorzio Sale Natura is not washed at all. This allows the salt to retain its natural content of trace element like iodium, potassium and magnesium that are mainly on the surface of the cristal of salt: these elements are fundamental for the healthy of the human body. 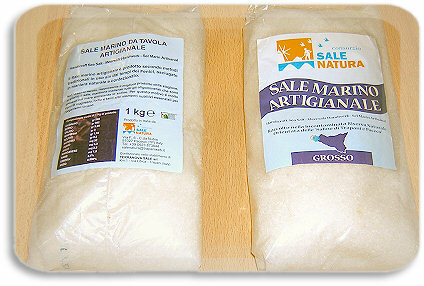 The handicraft sea salt of the Consorzio Sale Natura is different from the rock salt because these latters consists of sodium chloride for more than the 99% of their weight. This high content of sodium gives to the salt a too strong taste and desensibilizes the taste buds of the consumer. This latter is so induced to exceed in the use of salt thus having serious healthy damages like high blood pressure. The handicraft sea salt of the Consorzio Sale Natura is apparently a very simple and humile product but it is instead a superior product because of its superior preserving power and for the capability to give a very particular taste to several products like cheese, meat and so on. 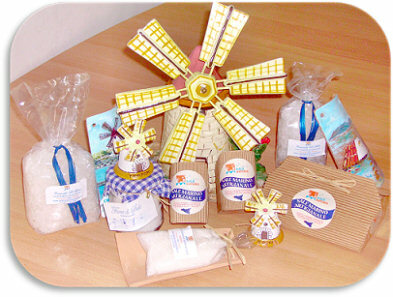 A packet of the handicraft sea salt of the Consorzio Sale Natura will distinguish you and your kitchen. The Consorzio Sale Natura offers it product in several packaging, ranking from the very tiny one of just fifty grams up to the largest one of twentyfive kilograms, being this latter very useful for the restaurant and the firms involved in meat anche cheese processing. The punctuality of the deliverings and the security of a unique product make the Consorzio Sale Natura a ideal business partner. For further information about the product please click here. Package of 200 grams (8 onces) of "Fiori di Sale"
Package of 500 grams (1.105 pounds) of "Cristalli di Sale" Package of 200 grams grams (8 onces) of "Cristalli di Sale" with earthenware made tile Package of 300 grams (0.66 pounds) of "Cristalli di Sale"